The Open Hex Mode command is used to open a file in a special, read-only viewing mode. After selecting the file to be opened from the standard Windows File Open dialog, a new window is created and the file is displayed within the window. Files opened with this command are displayed in a special format which has three sections. 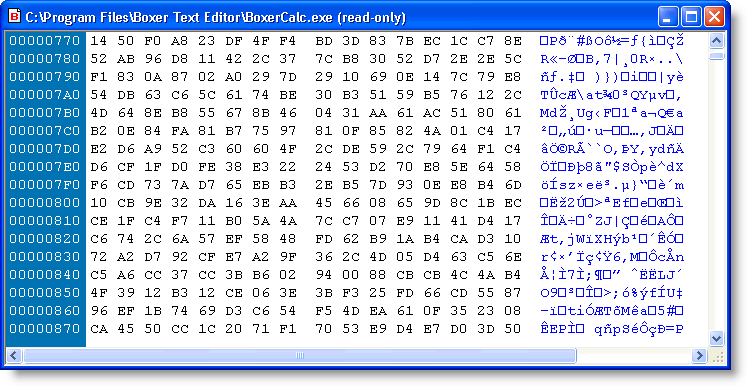 At the left, the byte offset into the file is shown in hexadecimal format. In the center, sixteen bytes are displayed as two-byte hexadecimal values. At the far right the same sixteen bytes are displayed as characters, except in cases where the character cannot be so represented. The representation of the sixteen characters at the right depends upon whether an ANSI or OEM screen font is in use. The screen font can be changed with the Screen Font command. The content of Hex Mode files can be selected and copied to clipboard, for example, and all other passive editing operations (searching, printing, etc.) are allowed. However, all operations that modify text are forbidden. Boxer will automatically use the Open Hex Mode command when asked to open files with the extension .COM, .EXE or .DLL. Files with these extensions are assumed to be binary files, which cannot be edited reliably with Boxer or any other text editors. An editor with hex / binary capability is required for editing such files, as well as a good understanding of the task at hand. The Go to Byte Offset command is sensitive to Hex Mode, and can be used to jump quickly to a specified offset within the file. See the Open command for details on using Boxer's custom file open dialog and the standard Windows file open dialog. The maximum file size for a file opened in Hex Mode is smaller than the usual file size limit. The limit is approximately 481 MB. This limit derives from the fact that the display of 16 characters in hex mode requires 80 characters of text.